Not too many moons ago we wrote a sparkling review of Spamalot, the online slot based on the Monty Python stage show. It’s a brilliant game, full of genuinely amusing moments, loads of bonus feature and a progressive jackpot. 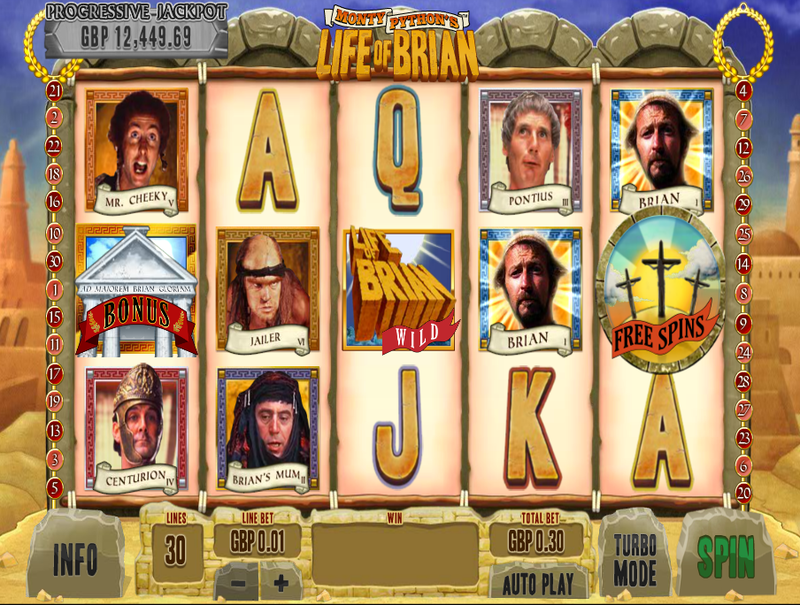 Now Playtech and their subsidiary Ash Gaming have released a follow up – it’s Life Of Brian and it is of course based on the funniest film ever made so read on to find out more. Life Of Brian kicks off with a lengthy intro movie featuring one of the songs from the film and when you’ve finished enjoying that you will see that this is a five reel game with thirty fixed paylines. The setting is obviously the Middle East around 2000 years ago and all the symbols are characters and items from the film. These include the Jailer, Mr. Cheeky, the Centurion, Pontius, Brian’s Mum and Brian himself. The wild symbol is the game’s logo and then there are two bonus symbols – a temple and the crucifixes – which kick off loads of features. Stoning Bonus – choose a character at who to fling a stone and win prizes depending on your choice; extra prizes can be won if any women are found in attendance. People’s Front Of Judea Bonus – find out what the Romans have ever done for you by picking items such as aqueducts and irrigation from a list and winning prizes. Romani Eunt Ite Domum Bonus – help Brian spray anti-Roman graffiti on the palace walls; cover as much as you can before the sun comes up for higher prizes. What’s So Funny Bonus – how long can the guards last without laughing as Pontius Pilate talks; pick the right guard for the biggest prize. This bonus can occur after any losing spin and you will see Brian fall through the reels and get caught by the spaceship. One stack of symbols will turn completely wild and you will receive respins and more randomly added wilds until you land a win. The gigantic Monty Python Foot Of God will randomly stamp onto the reels, awarding you the chance to pick a holy item and to pledge your allegiance to one of the Judean political parties in return for cash prizes. The Foot may also award you the progressive jackpot win whose total is displayed to the top left of the reels. Crucifixion symbols on reels three, four and five will kick off this bonus and your first task is to pick members of the Judean People’s Front Crack Suicide Squad who will each reward you with spins until you find the one which says ‘Start’. With each losing spin the multiplier will increase by 1x and that level will never decrease. If you can collect three golden crucifixion symbols during the spins you will get to play the Crucifixion Bonus at the end. Here you just need to pick one ‘crucifee’ to replay the round, win extra spins or a cash prize. There’s so much to this game but the paylines are fixed so there’s actually not much player interaction; however if you click the trembling bush underneath the reels the hermit will jump out and shout at you. This is just a fantastic game and Playtech/Ash Gaming clearly know how to combine the original material with an engaging slot. There’s nothing bad about it and it should be next on your list of games to play.